Roseau, Dominica – May 5, 2009……………… In the midst of an unprecedented global economic and financial crisis manifested by record fiscal deficits, huge government debt, mass unemployment and economic contraction in the major developed countries, the Labour Party Government of Prime Minister, Hon. Roosevelt Skerrit can still point to a number of significant achievements as it observes the 4th Anniversary since its May 5, 2005 General Election victory. In the last twelve months the Government can point to achievements in the areas of fiscal management, infrastructural development, geothermal energy development, agriculture and fisheries, tourism and human resource development. 48. 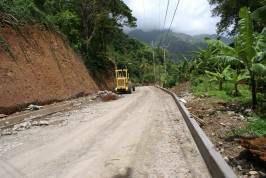 A number of communities, most notably Petite Soufriere, Boetica, Carib Territory and Woodfordhill continued to benefit from resources from the Dominica Social Investment Fund. Many communities also benefited from resources under the Basic Needs Trust Fund. 50. Dominica hosted a highly successful Reunion 2008 when thousands of Dominicans returned home on the occasion of the country’s 30th Anniversary of Independence. Reunion 2008 was a collaborative effort between the Government of Dominica, the Reunion 2008 Committee, private sector organisations in Dominica and Dominicans living overseas. As the Government looks forward to the next twelve months, the Roosevelt Skerrit administration is cautiously optimistic that the heightened implementation of its Public Sector Investment Programme, increased private sector activity coupled with its adherence to responsible fiscal and economic management, that Dominica can stave off the worst from the current global financial and economic crisis.